At Christmas time we place a whole almond in one of the bowl. The finder of the almond in their serving wins a prize. Traditionally is was a marzapan pig with a shinny coin in its belly. Place milk and rice in a medium saucepan over medium heat. Cook and stir until the rice is tender, about 20 minutes. Add sugar, salt and dissolved gelatin, cool. Add whipped cream and almond extract. Put in bowl and chill until fairly firm. 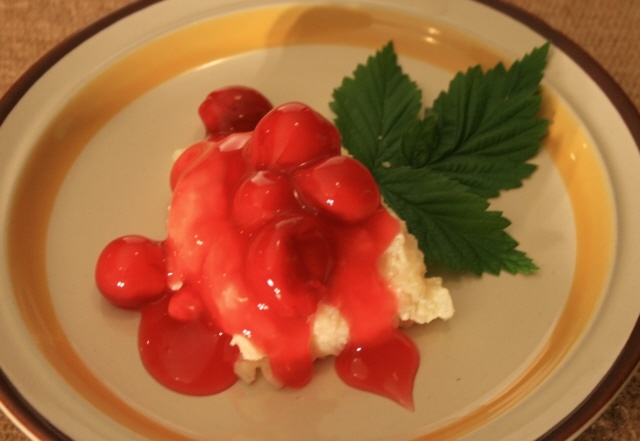 Serve with cherry sauce. (you can use Danish dessert pudding mix for an easy sauce) Sprinkle with nuts as desired . 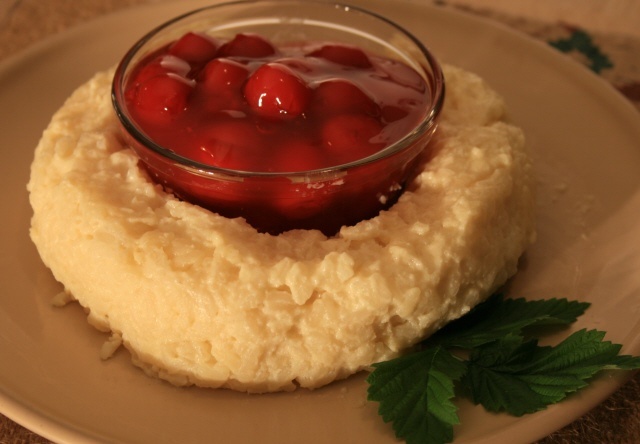 Cherry sauce can be made from cherry pie filling - just thicken with corn starch. Also you can add some slivered almonds to the pudding itself as well as topping with the chopped nuts. To make the presentation platter shown, allow the rice pudding to cool in the pan. Lightly butter the inside of a ring mold. Evenly spread the pudding in the ring mold being careful not to press too tightly. Refrigerate for 45 minutes or until the pudding is firm. Use a soft spatula to loosen the edges of the pudding from the side of the mold. Center a plate over the mold and invert. Holding the plate and the mold together, lightly thump the plate on a wadded-up dish towel. Place a small bowl of your selected fruit topping in the center of the rice pudding ring.